Mobile gaming has opened up the world of arcade-style experiences. What used to be a room full of quarter-driven machines has evolved to the modern era of handheld time-killers. This arcade style is particularly notable in newer games such as Penarium. Which also happens to be the game we’re taking a look at today. Didn’t you read the title? 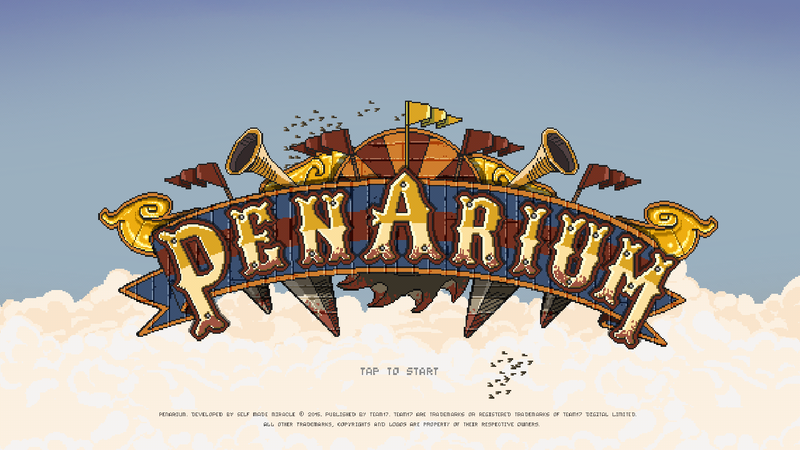 The story of Penarium is pretty simple: you play as a boy named Billy who works on a farm, longs for adventure, and joins a traveling circus where he finds out he must risk his life for the enjoyment of festival goers. Games are just so relatable these days. Unique story aside, the gameplay is what really shines in Penarium. The game’s main objective comes from obeying the ringmaster, who begins by asking you to jump around and smash barrels. Sounds simple enough, right? Well, what starts with simple barrel-smashing quickly evolves by introducing icicle cannons, walls of fire, and barrel-stealing birds. The natural progression of obstacles in life. Something I really enjoyed about the game was the graphics. Penarium utilized the retro-inspired graphics that are pretty common in mobile games these days. However, that’s by no means a bad thing, as the classic appearance of the app fits perfectly with the arcade-style gameplay. Additionally, Penarium offers something no game I’ve ever played has. Something the developers cleared up that no one in my time playing video games has bothered to reveal: an explanation for the double jump. One of the greatest mysteries in the history of gaming, the double jump has been defying the laws of game physics for decades. The explanation? Penarium has an “enchanted atmosphere.” Works for me. I really enjoyed my time playing Penarium. The game is addictive, aesthetically appealing, and brings back nostalgia of arcade experiences such as the original Super Mario Bros. And, despite the slightly morbid premise of playing as a kidnapped child forced to risk his life for entertainment (best not to think about it), the app provides a ton of charm every time you open it. Penarium is available on Google Play, iTunes, and more!